Last year I made a New York-bound train connection at Newark’s Penn station. 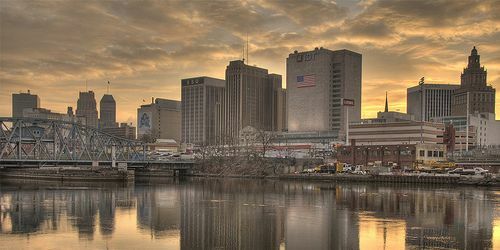 From the train, I caught a fleeting glimpse of downtown Newark and at the station I followed the bustle headed to the infamous sister metropolis, a mere 18-minutes away. That was the extent of my contact with New Jersey’s biggest city. This year I planned to go to Newark on October 7, to participate in the Quarter Mile Print. 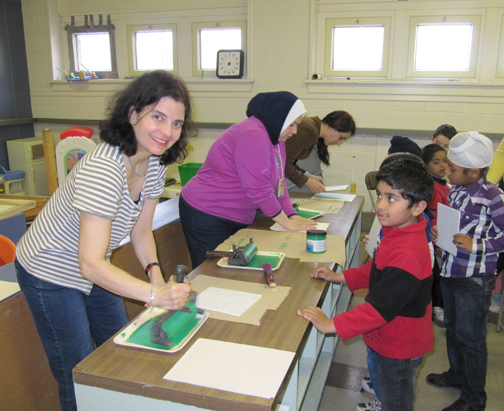 I looked forward to volunteering at this large scale community printmaking project. The public was invited to create monotypes along a plastic sheet measuring a quarter of a mile, to be printed onto paper by steamroller. Mother Nature had another agenda. Due to rain, the event got postponed to October 20. Nevertheless, on October 7, I visited Newark. On this wet Sunday, after the whirlwind of Manhattan, as I walked along the empty streets from Penn station to the Newark Museum, I wondered where everyone was hiding. At the museum, I met Stephen McKenzie, manager of the Arts Workshops for the past twenty years and organizer of the Quarter Mile Print. It was a pleasure to meet him and to visit the Arts Workshops department. 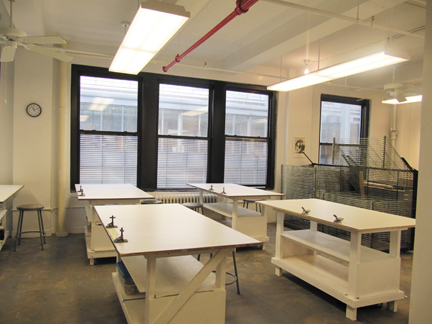 There are three well-equipped and bright studios: a multi-purpose studio featuring an etching press, a jewelry studio and a weaving studio. These spaces provide a lovely setting for creating art. 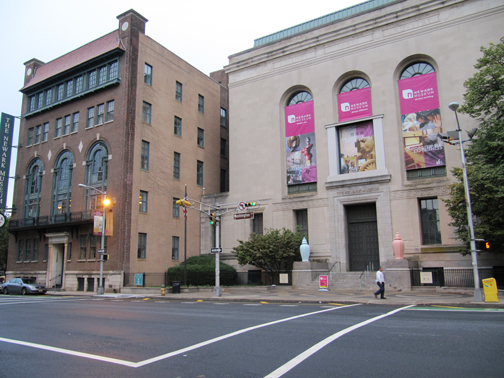 The Newark Museum also has an interesting Artists-in-Residence program. The education program features a wide array of classes and workshops such as Bookmaking, Quilting, Design, Photography, Metals and Jewelry, Dollmaking, Sculpture, Fiber, Digital Media and Printmaking. The Arts Workshops department, which also has a program for children, teens and families, has a very welcoming aura. There is even a lounge, tastefully adorned with faculty artwork, where students and teachers can mingle. Stephen gave me a tour of the museum, a place he knows like the back of his hand. In and out of back doors reserved for museum staff, we visited the galleries. 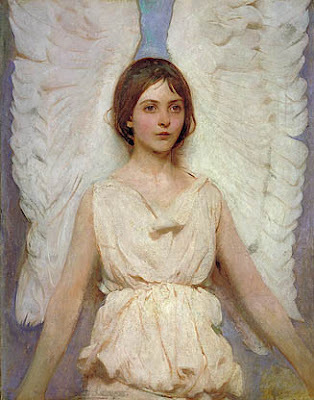 It was wonderful to discover the various collections and the special exhibit, Angels & Tomboys: Girlhood in 19th Century American Art, where angelic, domestic girls hang side by side with tomboys and working girls. I particularly enjoyed visiting the Ballantine House, a wing of the Newark Museum. This mansion was built in 1885 for Jeannette and John Holme Ballantine of the celebrated Newark beer-brewing family. It is a designated National Historical Landmark. 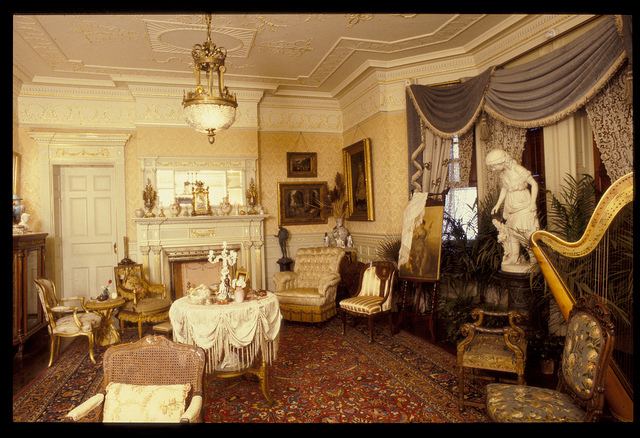 There is something magical about visiting period rooms. The beautifully restored dwelling, that once contained twenty-five rooms and sixteen fireplaces, is suffused with a Victorian atmosphere that transports you to another world. 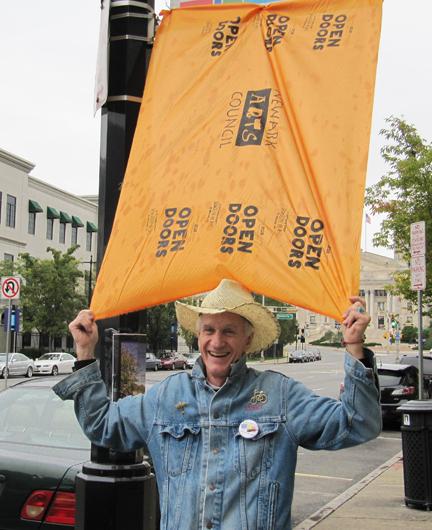 My visit to Newark coincided with Open Doors, an annual citywide event showcasing the arts, organized by the Newark Arts Council. The event features tours, with free shuttles, of curated, juried and pop up exhibitions, galleries, artists’ studios and available artists’ spaces. It also spotlights special events such as the Quarter Mile Print and the Creation Nation Art and Peace Parade. It was a perfect opportunity to discover the flourishing art scene in the city and once again Stephen, ever so jovial, was the perfect guide. A stroll down Market Street revealed a series of galleries housed in former furniture outlets. It was interesting to discover the Studio Residency Program at Gallery Aferro, where for a reasonable rate, selected artists have access to sectioned studio space on the second floor of the gallery. 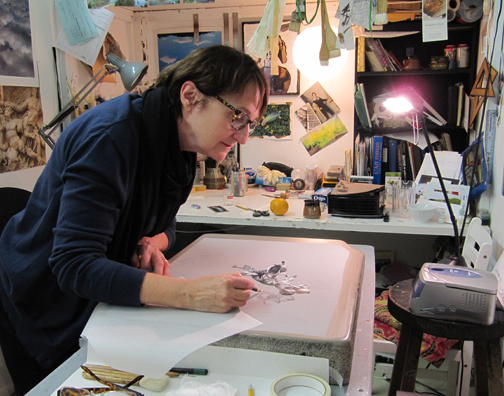 I browsed through the studios, discovering artwork by the current artists-in-residence. I enjoyed Rupert Ravens Contemporary. Stephen introduced me to Rupert Ravens, his buddy from Rutger grad school days. Many eclectic pieces caught my eye. I was captivated by Summer Lightenings, a video by Russian artist, Victor Alimpiez. Hiding in the back room, this video shows school girls drumming their fingers on their desks and covering their mouths with their hands while thunderous tracks of summer lightenings are superimposed intermittently. The effect is menacing and eery. On a lighter note, the group show featured a big metal hopscotch board with embossed numbers, fixed to the floor. It begged to be played with, so I did, hopping all the way to number 4! My understanding is that as the supply of large studio spaces in New York wears thin and rents skyrocket, artists and galleries are now turning to Newark, adding effervescence to this once primarily industrial city. As much as I wanted to participate in the Quarter Mile Print, it was an unexpected treat discovering the established and contemporary art scene in Newark. Thank you Stephen McKenzie for opening the doors of art for me in Newark. Thank you Mother Nature for raining in Newark on October 7 and letting me walk through those doors. Times Square-42nd Street subway stop. 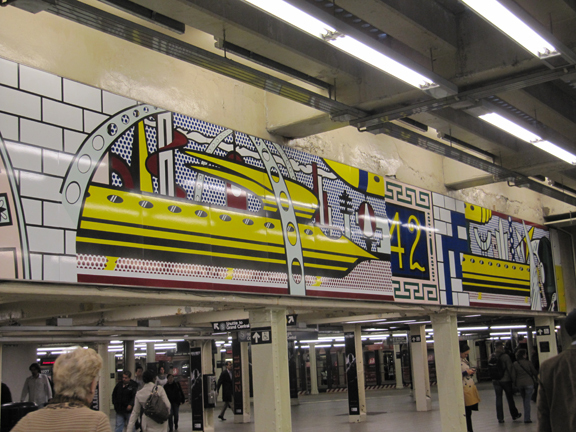 Mural by Roy Lichtenstein. Every trip I take to New York is different. Yet each visit is a condensed, exhilarating and enriching experience. 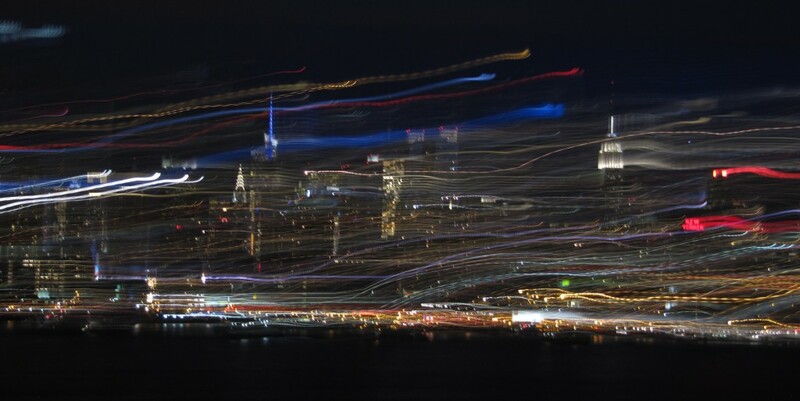 Whenever I step foot into NYC I have a “the world is your oyster” moment accompanied by a surge of energy. I navigate the streets and the subway system, often with a fixed plan, sometimes with a loose idea of an area to explore, always with camera at hand and expectation in my soul. I recently drove to New York with my friends. 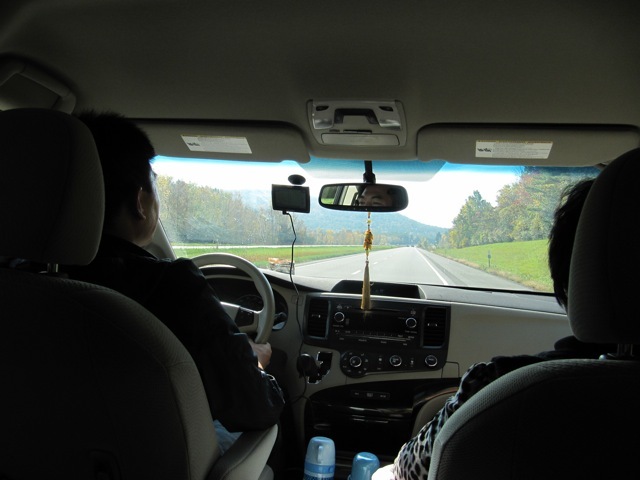 To be more accurate, I was driven to New York by Tom, my friend Gelin’s husband. I was well accompanied in their spacious van, with Gelin, her five-year old twin sons, her two-year old son, her husband and mother. I have traveled to the Big Apple by bus, train, plane and behind the wheel. The best way to go is “chauffeur” driven, door to door, with good company to boot! New York feels like my backyard playground, and at 532 kilometers south of Montreal, straight down the I87, it’s a breeze to get there. The complicated piece of trip logistics, barring visa issues, is lodging. 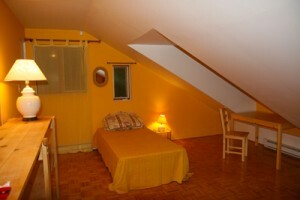 My friends and I rented an apartment on the Upper West Side of Manhattan, a hop away from Central Park and the subway. 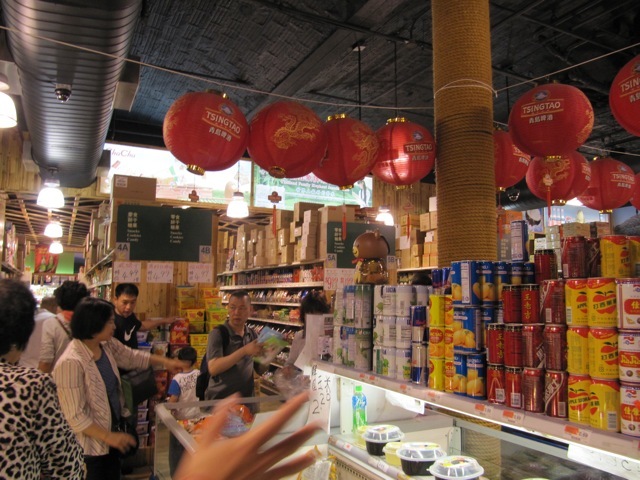 We had four comfy bedrooms, two closet-sized bathrooms with cereal box-sized sinks, an infinitely long hall that begged for a skate board, a brick walled living room and a kitchen where we churned out delectable meals concocted from ingredients bought from China City in Chinatown. This was Tom and Gelin’s mother’s first visit to New York. It was a sunny Saturday. 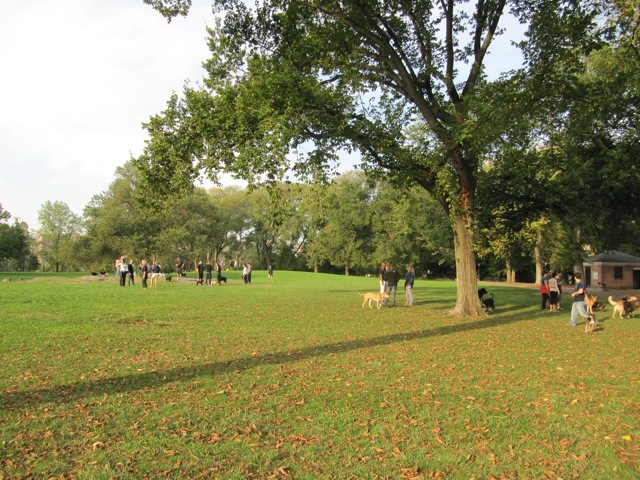 New Yorkers and Columbus Day weekend visitors flocked the streets in short sleeves. The itinerary started with the inevitable Times Square, a stroll down Fifth avenue to Rockefeller Center, in and out Saint Patrick’s Cathedral, past Bergdorf Goodman, down to the subway, up the Canal Street stop, through Chinatown to a table at the back of a bustling Cantonese restaurant, which my friends chose for the shiny roasted ducks hanging in the front window. You haven’t tasted lobster until you try their ginger shallot lobster. Now imagine doing this hike with our party of seven. Tom, with laptop in tow, often carried a twin on his shoulders while pushing his toddler in the stroller. By 5:00 my friends were ready to go home. I wasn’t. 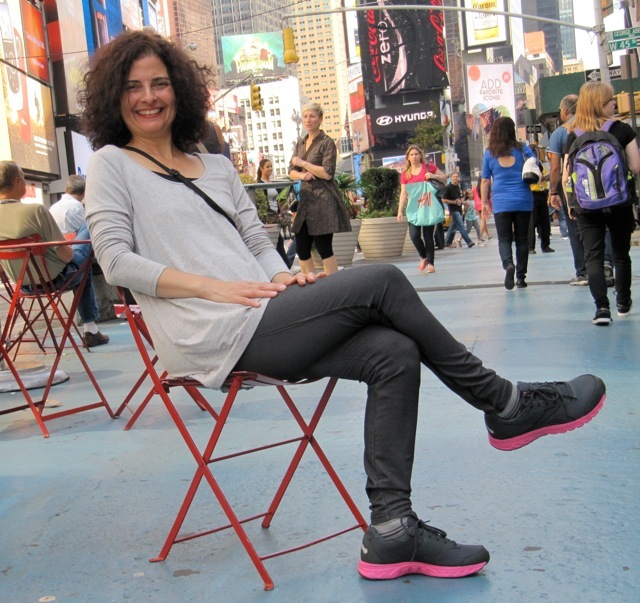 I gave Gelin a rendezvous at 7:00 p.m. in Times Square. Yes, this can be done successfully. I met my friend on the imposing red glass stairs, where I was able to witness a young man kneeling down and proposing to his girlfriend while a crowd of strangers cheered him on. 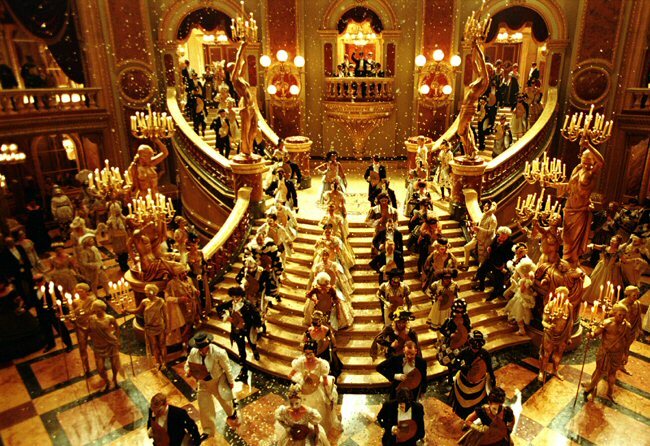 Gelin, a theatre fanatic, invited me to The Phantom of the Opera on Broadway. The show was spectacular, powerful and moving. During standing ovation, the man next to me had tears rolling down his cheeks. A couple of nights later we went to see Evita, despite the fact that it was Ricky Martin’s night off! It was entertaining but the Phantom stole my heart. I spent Sunday afternoon in Newark, New Jersey, an experience that deserves its own blog. Stay tuned! 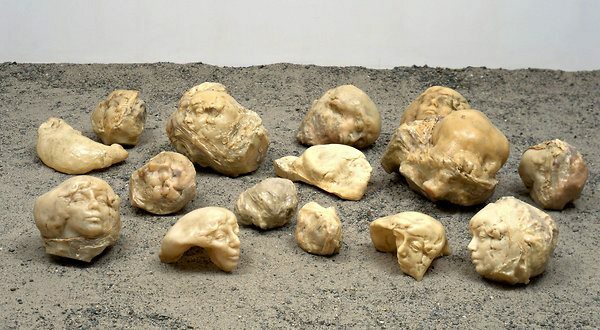 “Tumors Personified," part of the survey show of Alina Szapocznikow’s work at MoMA. On my last day in New York, my dear friend, Hasmig, invited me to the Museum of Modern Art. The highlight of that visit was the Alina Szapocznikow exhibit. At first I did not realized we had stumbled onto a solo exhibit of this accomplished Polish artist’s work. When I saw her first piece, I was captivated. As I advanced through rooms and was treated to more of her work I fell under her spell. 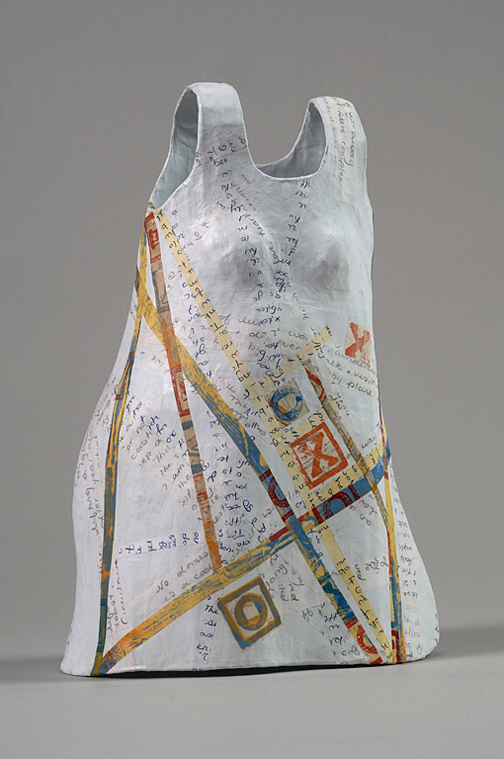 The show ends with her “Tumor “ sculptures made with resin, gauze, crumpled newspapers and photographs. Through these powerful pieces Szapocznikow wanted to preserve the impermanence of the body. What is a trip to NYC without a visit to Strand Book Store? This is a veritable Ali Baba’s cavern brimming with new, old and rare books. In the 1970s, Pulitzer Prize-winning journalist George F. Will wrote, « the eight miles worth saving in this city are at the corner of Broadway and 12th Street. 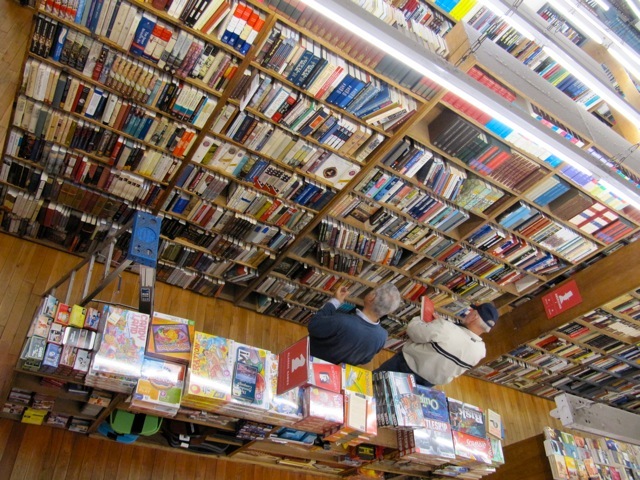 They are the crammed shelves of the Strand Book Store. » For a good hour I lost myself in page after page. I loved the section of New York books and always cherish reading true stories of people’s first impressions of New York. I call it New York, the apple of my eye, the place I like to hide and seek myself, time after time, always new, exquisite, exhilarating and exhausting! Photos by Talleen Hacikyan, except for Phantom of the Opera. 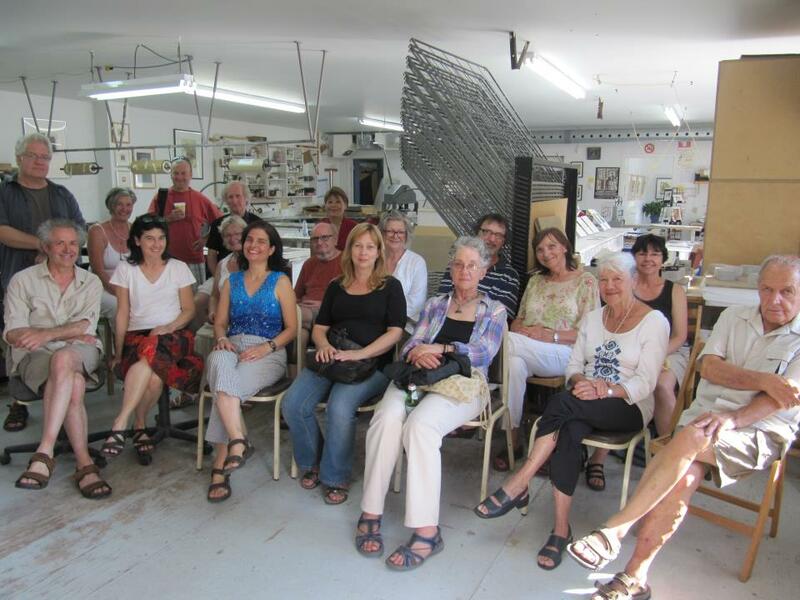 It was Open House at Atelier Circulaire on September 28 and 29 in celebration of Journées de la culture. Members were on hand to interact with the public, give demos and transmit the spirit of Atelier Circulaire. In between my informal PR raps about the merits of collagraphy and monotype to visitors, I conducted some mini interviews with artists. The atmosphere was conducive. Everyone was probing artists with questions so armed with notepad, pen and camera, I hopped onto the bandwagon. Works in brewing industry. Sales rep, international beer judge. Artist. The big stones, the big presses, the 24-hour access. Being part of a creative group that lets me develop my work. The Icarus project where six artists created a 6 x 3 foot linocut is a wonderful example of a creative collaboration at Atelier Circulaire. Monotypes, collage, prints on posters, old books, billboards. Retired college professor. Full time artist. The variety of work, solid technical competences of artists, that you do your own personal work while functioning in a group. In the beginning he explored each printmaking technique. After a “tour of the garden,” he began mixing techniques and media. He had a traveling exhibition of engraved car hoods. 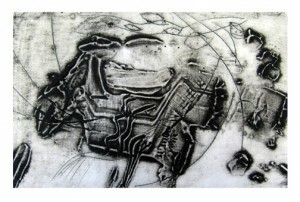 Manière noire, monotype, collagraphy, lithography, soft ground etching. The spirit of exploration, the atmosphere. Before knowing him, she discovered François-Xavier Marange’s paintings at Galerie Simon Blais and was mesmerized by his art. Years later she found herself in his studio during an Open House and bought one of his prints. Some months ago she had the pleasure of meeting him at our studio and finally exchanging words. Burin, manière noire, etching, linocut and silkscreen. Infrastructure, presses, good artists with whom he can exchange information. 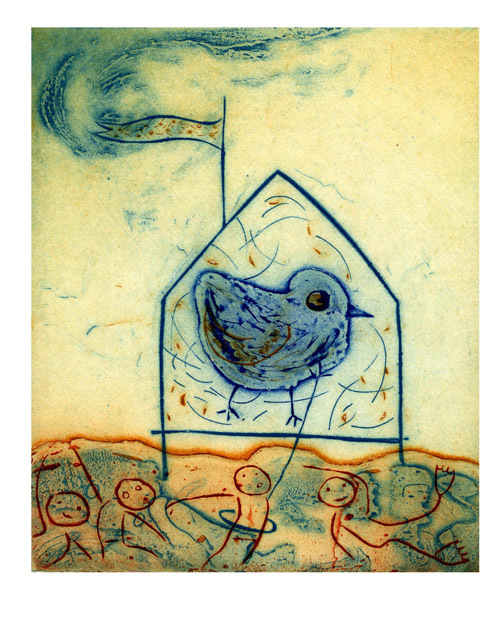 Provides access to techniques that let him explore his imagination and his passion for printmaking. Likes engraving, leaving traces that oscillate between violence and delicacy. Found ladies underwear in the hall. In the hall? Once in the hall and once in the drying room. What were they doing in the drying room? Maybe they were wet! Etching studio manager, full time printer, educator. Pleasant easy going atmosphere, light, people, equipment, conducive to concentrated work. An important turning point in the history of Atelier Circulaire was when we united the etching studio with the lithography studio, instead of housing them in two separate buildings as we used to have it. This created conviviality. 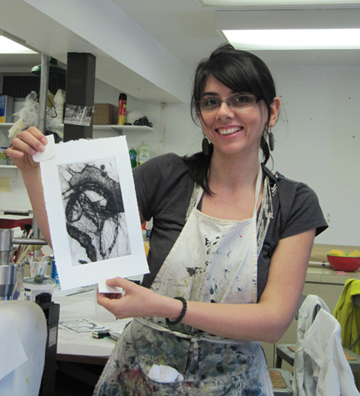 Lithography studio manager, educator, printer and artist. We all give and each of us feel as if we belong. Exchanges and open communication that let accidents turn into successes. One morning a colossal offset press had disappeared from the studio. It belonged to an artist, who decided to sell it without prior notice. The administration had just invested a large sum of money to have it transported to the studio. It happened to fit into the freight elevator. At that point, as litho manager, he decided that the studio would no longer house privately owned presses. 90% of our problems were solved. Part-time drawing teacher at UQAM School of Design and artist. Solitude within the group. Similar in feeling to when she explored Venice without a map–you can get lost with the knowledge that you can always find yourself back. Training, support of Paule and Carlos, and affinities with certain members helped her grow as an artist and be more active in her field. Reuniting with artist Denis Malo, with whom she had studied silkscreen at UQAM, who became a member at the studio after visiting a print show organized by Rolande Pelletier. Denis, Rolande and Nicole used to teach together at Collège du Vieux-Montréal so it is special to be working in the same printshop today. Collagraphy, monotype, digital printing, photography. Educator, art rep technician, artist. Quality of the equipment, space, light. Can work in isolation or with the group. Good equipment gives positive results. 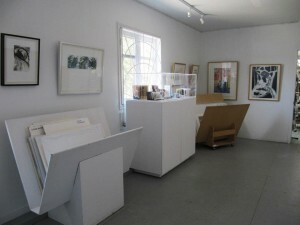 Atelier Circulaire opened the doors to her and to two other artists in 1985, to work free of charge on an artists’ book. This welcome paved the way to loyal membership. Fascinated by Atelier Circulaire’s evolution. In the beginning the studio was good, it passed through some rough times and now it has become adult, and is great. Merci à tous les artistes pour avoir participé. 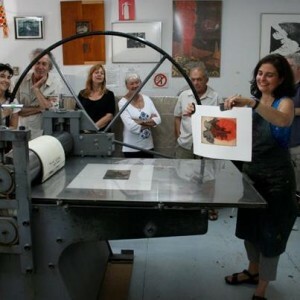 From June 25 to July 8, 2012, I did a two week residency at Atelier de l’Île printmaking studio. Located in the heart of Val David, in the Laurentians, the studio is a joy to work in. It is infused by a warm and peaceful atmosphere, not only due to its idyllic natural setting but also because of the artists who work there. It also helps that the studio is in ship shape, thanks to the workshop’s efficient technicians, Olga Inés Magnano and Paul Ballard. Everything has a place, and as my mother says, that is the key to keeping organized. 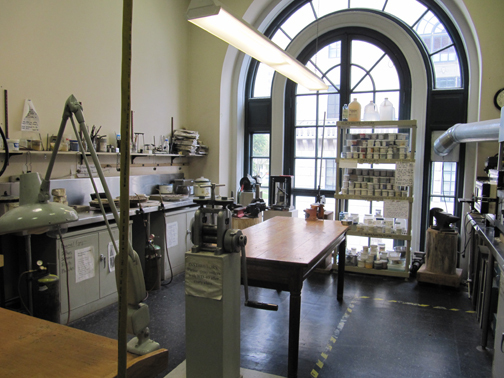 The studio is equipped for intaglio, silk screen, lithography, photo etching, photographic and digital processes, and paper making. There is also a small gallery upon entering the studio. Atelier de l’Île got its name because when it originally opened in 1975, it was located on a small island on the Rivière du nord. 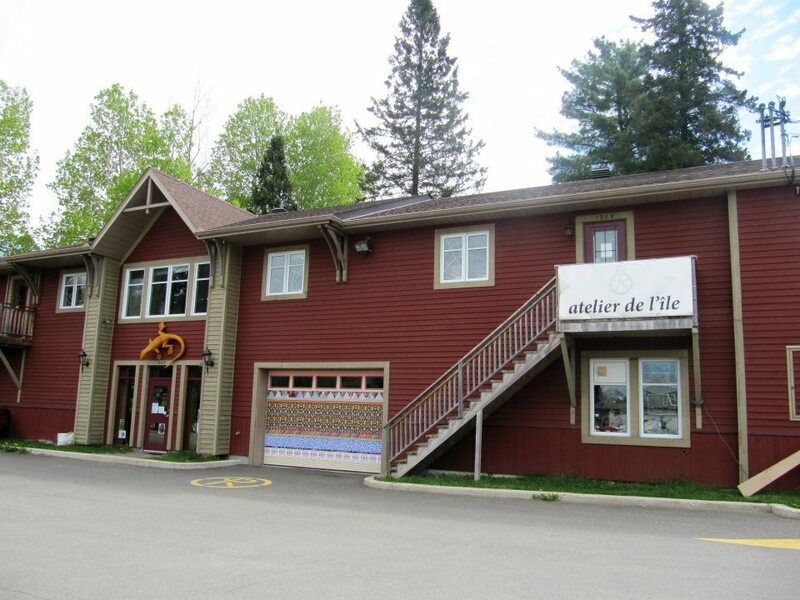 It has been in its present location on Dufresne Street in Val David since 1987. Founded by Michel Tremblay, it was modelled after S.W. Hayter’s Atelier 17, in Paris. 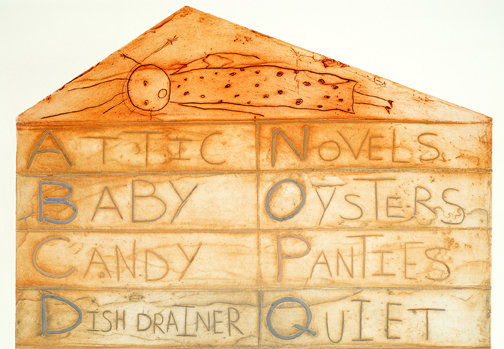 Artists, writers, paper makers, poets, printers and book makers worked together at Atelier de l’Île on creative projects, most notably on artists’ books. It seems fitting that I created an artists’ book during my residency. When I started working, I realized what a delicate balance and interconnection there is between life and art. My book consists of stories and prints based on my impressions of Val David. My studio work was nourished by hands on experience in and around the village. I am lucky enough to have gotten a second residency to complement the first. 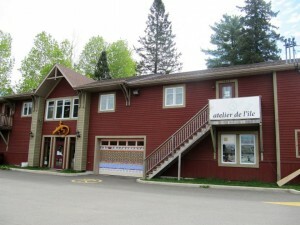 While I work at Atelier de l’Île I was staying at the International Writers’ and Artists’ Residency, also in Val David. The Centre is directed by Flavia Cosma, Romania-born Canadian poet, author and translator. This is where I slept, ate and wrote. Nestled in a pine forest with a sweeping view of the Laurentian mountains, this is an ideal spot to empty one’s head and fill the page. Flavia built this spacious, three-story house nine years ago. She designed it so that it would be conducive to creative retreats. When I was in my third floor bedroom, I had the impression that I was alone in the house. I felt at peace at my desk, typing away as birds sang. Flavia explained that the house was built over an immense rock and that perhaps the electromagnetic energy emanating from the rock is responsible for this zen-like sensation. Private writing time was balanced by shared meals at suppertime with Flavia and another artist from California, presently doing a residency. My two weeks proved to be productive. 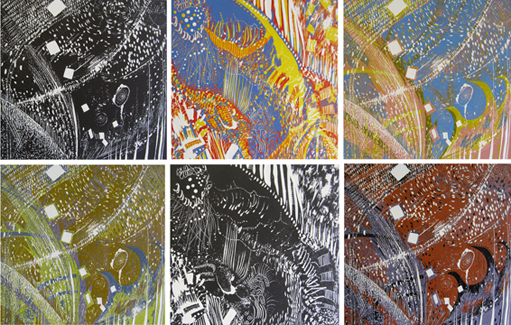 I wrote the rough drafts of eight stories and created eight collagraph prints to accompany my texts. I spent my second week printing proofs of my images. I worked seven days a week, around the clock, only taking time off for my precious swimming breaks. I wrapped up my residencies with a conference, at Atelier de l’Île. The event was well attended with Madame Nicole Davidson, Val David’s mayor and staunch supporter of the arts, local and Montreal artists, writers and interested folk. I displayed original prints and artists’ books, gave a digital presentation of my work through the years, connecting my images to my narrative approach and to my writing. After a break, I presented my residency project and gave a demonstration of how to print a collagraph. My public was warm and it was a pleasure sharing my experience. These two weeks in Val David will be forever etched in my memory as one of the high points in my career. 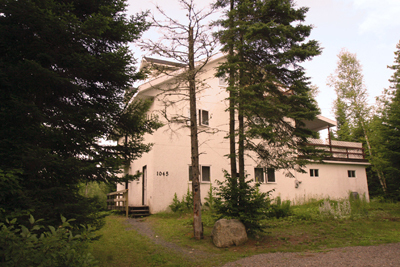 Not only did I plant the seeds of a new artists’ book but I forged new connections in this charming artist’s village known as Val David. Sea My Prints is a solo exhibition of my early and recent relief prints, at Atelier Circulaire, from June 1 to 22, 2012. I discovered woodcut and linocut printing during my last session of my Bachelors of Fine Arts and Art Education, at Université du Québec à Montréal, in 1985. It was in Monique Charbonneau’s Relief Printing class. I felt an instant affinity for wood, its warmth, its grain, its smell as I carved out my textures. 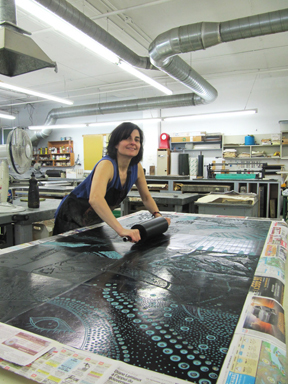 Immediately after graduating, I became a member of Atelier Circulaire printmaking studio, where I still work today. At the time, the studio was located in Old Montreal, on the fringe of Chinatown. 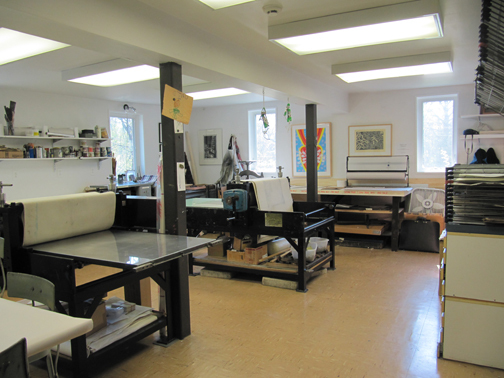 This vast loft, filled with inspiring artists and excellent printmaking facilities, was to become my second home for the next twenty-six years. A few days after joining the studio, an artist handed me a few square pine plates. She urged me to explore textures. This led to the Sea and Waves series, two varied editions, shown together in Sea My Prints, for the first time, in a mural of 24 prints. 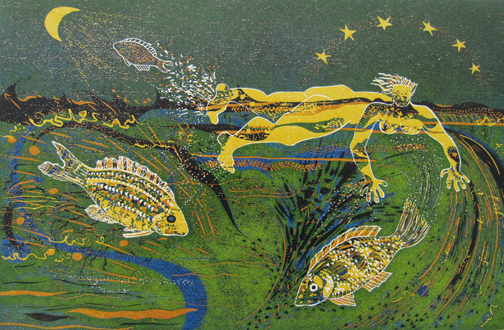 These prints led to the Fish and Swimmer series, carved in cherry wood. These early woodcuts represent a definitive period for me. I worked intensely, often into the wee hours of the morning, when the silent phone and my solitude became my allies. 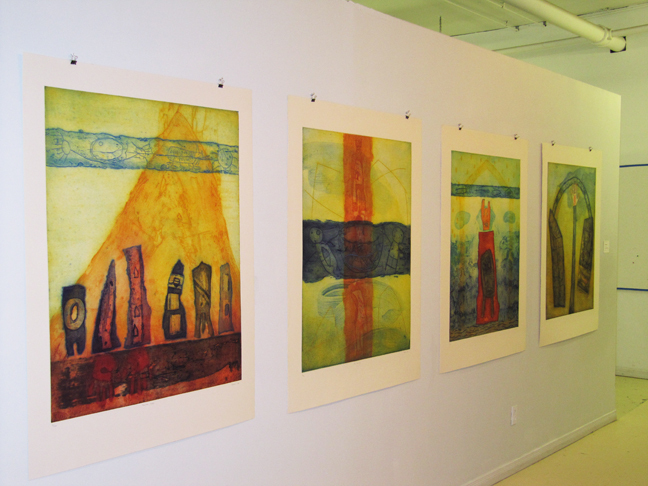 Two years later, I had my first solo exhibition with my woodcut prints at the Tekeyan Armenian Cultural Association, in Montreal. Through the years I have gravitated to other printmaking techniques such as collagraphy and monotype. However, I periodically return to relief printing. I made Dances of Sun and Rain, at Atelier Mille Feuilles, in Rouyn-Noranda, Quebec, in 1991. This was the first time I combined linocut and collagraph printing. More recently, in 2011, I embarked on La chûte d’Icare, an ambitious collective linocut venture with five other Atelier Circulaire artists. My Icarus and Icaro series stem from this project. 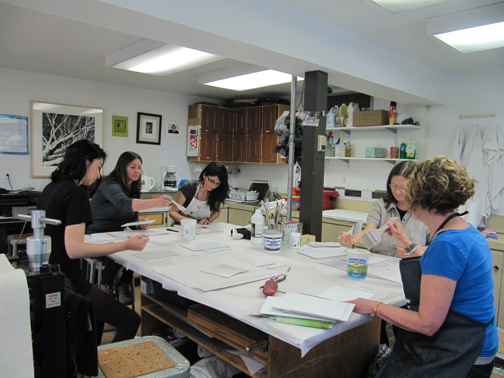 I have had the pleasure of teaching relief printing at the Saidye Bronfman Centre, the Montreal Museum of Fine Arts and Atelier Circulaire. 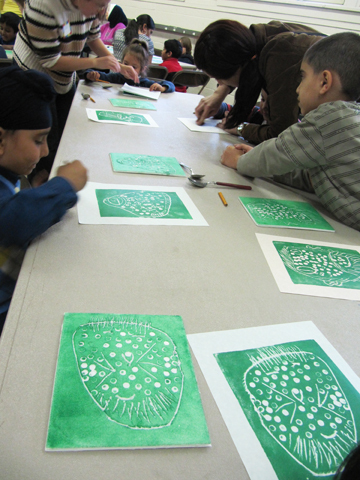 I’ve also been teaching a child-friendly relief printing technique in elementary schools across Quebec for the past 19 years through the Culture in the Schools program (Scroll down to next blog). 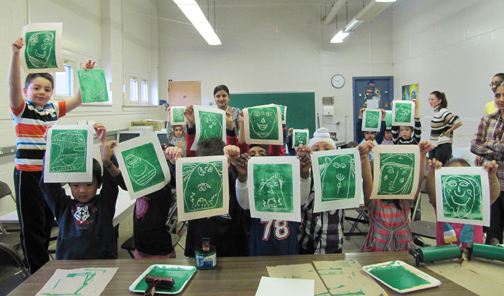 My most memorable teaching experience, however, was in 2003, when I taught an intensive 17-day woodcut printing workshop to Inuit students in Inukjuak, Nunavik, during the Nunavik Annual Artistic Workshops (Go to http://talleen.unblog.fr/2008/06/ and scroll down). It seems fitting to be showing my woodcut and linocut prints at Atelier Circulaire. They are intrinsically linked to my experience here. The desire to show my early relief prints has to do with the need to reveal a little known facet of my artwork. It is also a homage to my entry into Atelier Circulaire and the professional art world. By looking back at this period and reflecting on how my work has developed I reap a satisfying energy that pushes me to continue creating into the future. 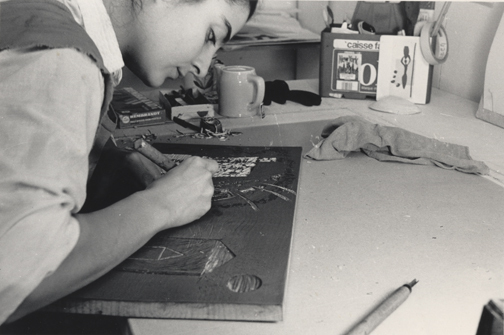 J’ai découvert la gravure sur bois et la linogravure pendant la dernière session de mon baccalauréat en Arts Plastques et Enseignement des Arts Plastiques, à l’Université du Québec à Montréal, en 1985. C’était dans le cours de gravure en relief de Monique Charbonneau. J’ai ressenti une affinité instantanée pour le bois, sa chaleur, son grain et son odeur lorsque je gravais mes textures. Immédiatement après avoir graduée, je suis devenue membre de l’Atelier Circulaire, où je travaille encore aujourd’hui. L’atelier était situé dans le Vieux-Montréal, près du quartier chinois. Ce loft immense, avec son groupe d’artistes inspirants et son équipement de gravure impressionant, allait devenir ma deuxième maison pour les prochaines vingt-sept ans. Quelques jours après être devenue membre de l’atelier, une artiste m’a donné des plaques carrées en bois de pin. Elle ma conseillé d’explorer divers textures dans le bois. Ceci m’a amené aux séries Mer et Vagues, ce qui m’ont conduit à la série Nageuses et poissons, gravée dans le merisier. Ces bois gravés représentent une période définitive pour moi. Je travaillai intensément, souvent jusqu’aux petits heures du matin, quand le téléphone silencieux et ma solitude alimentaient ma créativité. Deux ans plus tard, j’ai eu ma première exposition solo au Centre culturel Tekeyan de Montréal. Au fur et à mesure des années j’ai pratiqué d’autres techniques de gravure, notamment la collagraphie et le monotype. Néanmoins, je reviens périodiquement à la gravure en relief. J’ai fait Dances of Sun and Rain à l’Atelier Mille Feuilles, à Rouyn-Noranda, Québec, en 1991. C’était la première fois que je combinais le bois gravé avec la collagraphie. Plus récemment, en 2011, j’ai participé au projet de linogravure ambitieux, avec cinq artistes de l’Atelier Circulaire: La chute d’Icare. Mes séries Icarus et Icaro font parti de ce projet. J’ai eu le plaisir d’enseigner la gravure en relief au Centre Saidye Bronfman, au Musée des beaux-arts de Montréal et à l’Atelier Circulaire. J’enseigne aussi cette technique, depuis 19 ans, dans les écoles primaires partout au Québec, avec le programme Rencontre culture éducation. Toutefois, mon experience d’enseignment le plus mémorable était en 2003, quand j’ai donné un stage intensif de bois gravé de dix-sept jours à un groupe d’artistes Inuits, à Inukjuak, Nunavik. Il me semble approprié de montrer mes gravures en relief à l’Atelier Circulaire car elles sont étroitement liées à mon expérience dans cet atelier. Le désir d’exposer ces oeuvres est lié au besoin de dévoiler ce côté peu connu de mon travail. C’est aussi un hommage à mon entrée dans l’Atelier Circulaire et dans le monde de l’art professionnel. En jetant un coup d’oeil à cette période et en réfléchissant au développement de mon travail, je ressens une énergie paisible qui me pousse inlassablement à continuer ma création. 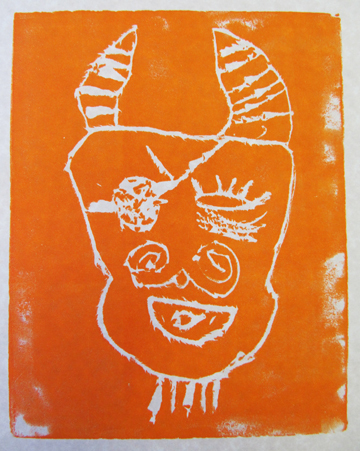 It’s been 19 years since I gave my first printmaking workshop in a school with the Culture in the Schools program. It still thrills me to walk into a classroom of new students and reveal the magic of printmaking. Through the years I have visited elemenary and high schools across Quebec, from Saint Jerome in the Laurentians, to Lac Megantic in the Eastern Townships, to Thedford Mines in Chadière-Appalaches. My main playground these days, however, is Montreal’s West Island. This week I visited École Dollard-des-Ormeaux. I gave 12 workshops to 240 students over 4 days. It was Semaine des Arts. The spotlight was on Africa. 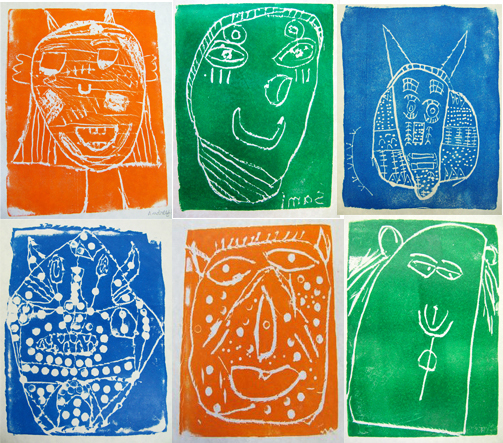 A musician gave percussion workshops while my students created prints inspired by African masks. After showing my early series of woodcut prints, I demonstrated how to hand print a linocut with a spoon. The younger the audience, the louder the oohs and aahs. Often as I lift the printed image from the inked plates before many pairs of incredulous eyes, I am treated to a hearty round of applause. After observing images of African masks, each student engraves a styrofoam plate and creates a print inspired by our theme. Through the years I have streamlined the elementary school workshop to adapt it perfectly to the 60 minute format. I pride myself on keeping entire groups stimulated, curious and busy up to the last second before the bell rings, never going overtime. Interacting with students is a joy. I asked a grade three class if they have artwork on the walls at home. 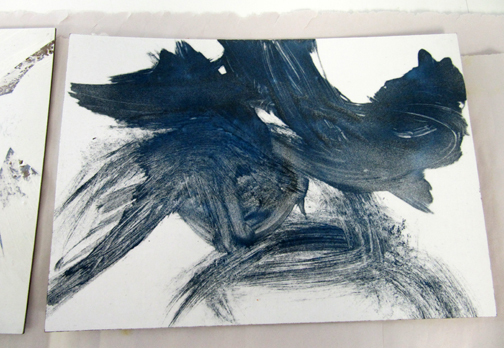 One boy told me about a painting of horses galloping in fields, with flowers and a barn. “One horse is white and the other is black,” he added. A girl told me that her family has a big painting of the Red Square hanging in the living room. The teacher told us about her limited edition Norman Rockwell print, a winter scene bought at an auction. Everyone described these images with fondness and pride, demonstrating how strongly we identify with art. When a new group walks into my class, I scan the unknown faces, watch them settle at their tables and try to guess who will produce original work. 240 students tend to become a bit of a blur and in the halls it is they who recognize me. I get spontaneous hellos, waves, smiles and even leg-level hugs from very little girls. The children who manage to stand out in my mind are those who break the mold…and sometimes my patience! One grade two boy was chock-a-block with questions, never related to the present situation, always in anticipation of what lay ahead. He was also the student who persisted the longest at his print, paying attention to detail and texture, just as I required. As he observed his print, he said, “I think there’s an artist in me!” When I saw him in the hall on my last day, his blue eyes gleamed behind his glasses and he said, “I so much want to make another one!” At that point I knew my mission was accomplished. I saw the charming building that houses the Printmaking Center of New Jersey (PCNJ) for the first time on Friday the 13th of April, 2012. After a pleasant morning drive through quaint villages and rolling green hills, Irena Pejovic pulled her car into the parking lot of 440 River Road in Branchurg and announced, “Here we are!” I felt lucky to be there, about to teach in this award-winning center that has been encouraging the fine art of printmaking through exhibitions, education and open working studios for the past forty years. 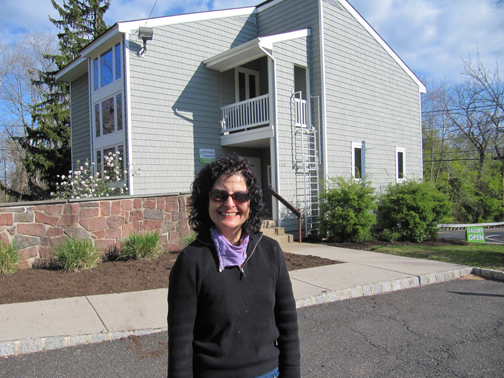 I discovered PCNJ last winter when Irena contacted me after having read my blog, Printmaking Studios in New York. She prints at PCNJ and serves on the board of directors. When I visited the center’s website I was struck by their involvement with the community. I was particularly impressed with the Combat Paper Program, where veterans transform military uniforms into handmade paper and then into healing works of art. PCNJ’s education department also grabbed my attention when I saw the vast selection of interesting workshops offered to adults and children. Little did I know that a few months later, the list of adult classes would include Introduction to Collagraph with Talleen Hacikyan. 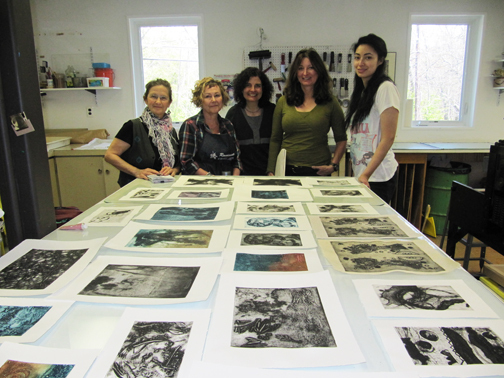 I taught my intensive two-day workshop to a group of five women in PCNJ’s sun drenched etching studio. This functional space is well organized and pleasant to work in. I especially enjoyed working with their Charles Brand etching presses, that operate with a hand-cranks that turn like butter. It was a bonus to have Irena in the class, who was my efficient assistant, setting up presses, making registration templates and showing me where to find things. Students worked intensely. On Friday they made small plates where they explored many collagraph techniques: drypoint, carving, ripping, collage, carborundum and creating textures with acrylic gel and plaster. Before the end of the day everyone printed one black and white print and was able to leave with a concrete idea of their day’s work. Saturday was printing day. Students had plenty of plates with which to practice the inking and wiping techniques I showed them. 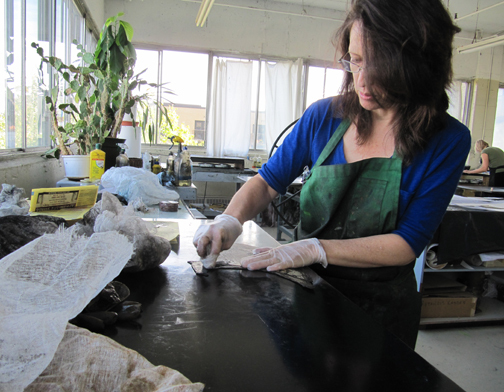 One student came to class with a pile collagraph plates she worked on at home until midnight the previous night. “I want to get my money’s worth!” she told me with a beaming smile. After students printed some black and white proofs, I explained the basics of color printing, and everyone started playing with rich hues, blending them together on their heated plates with tarlatan. The class ended with a tabletop exhibit of everyone’s work. After a round of constructive and encouraging comments, I left them with one of my favorite tricks passed on to me from a master printer. I showed how to “erase” undesirable ink marks from the margins of a wet print with a damp sponge. Linda Helm Krapf, executive director of PCNJ, stepped into the positive energy that filled the studio as we enjoyed the displayed prints. 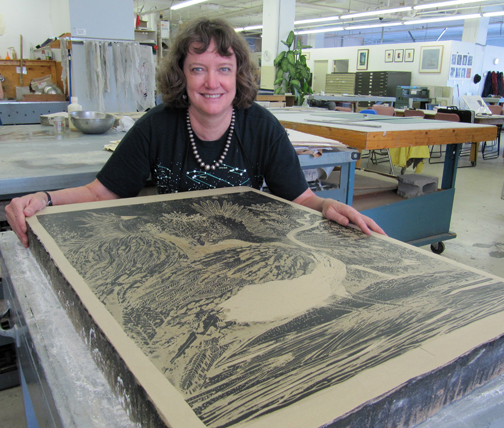 She looked at everyone’s artwork and exclaimed, “Collagraph rocks!” Linda marveled at how the direct, uncomplicated methods of collagraphy yield such alluring results. After the workshop I went upstairs to the gallery for the opening reception of The Best of Experimental Printmaking Institute. 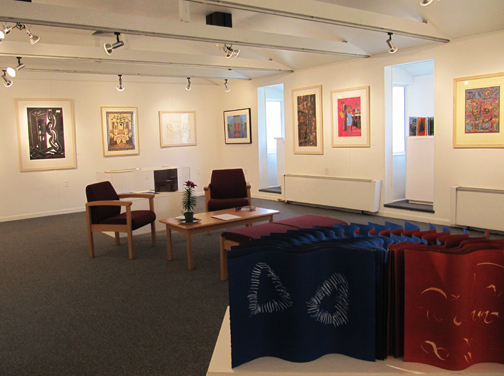 I admired the striking prints and outstanding artist’s books from EPI at Lafayette College in Pennsylvania. This unexpected treat was the perfect way to end my visit to the Printmaking Center of New Jersey. Thank you Linda and Irena for making this visit possible. 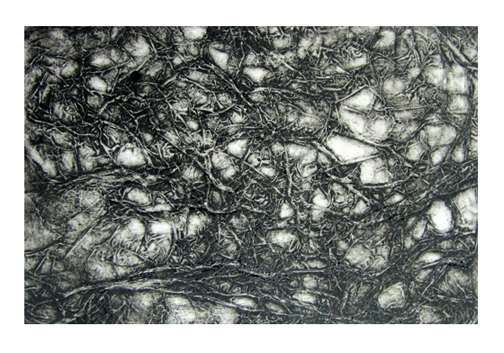 The term collagraph is derived from the Greek word koll or kolla, meaning glue and graph, meaning drawing. 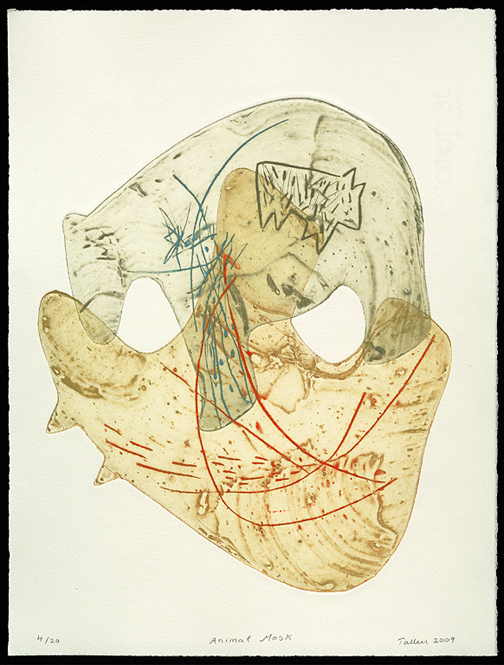 In the 1950’s, collagraph became accepted as a legitimate printmaking technique, largely due to the abundance of work produced by Glen Alps, a printmaking professor from the University of Washington, in Seattle. Elementary collagraphic techniques can, however, be detected in 19th century prints. 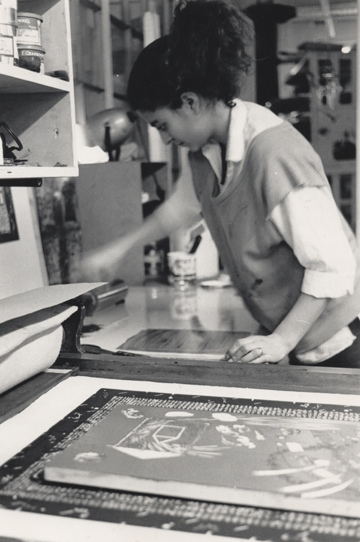 The development of collage as an art form in the early 20th century also led to collagraph printing. Collagraph is a printmaking technique where various materials can be glued to a plate. Paper, fabric, leaves, egg shells, coffee grounds, carborundum powder, plaster and acrylic gel medium are some examples of materials that can be used. The plate-making process is entirely non-toxic. 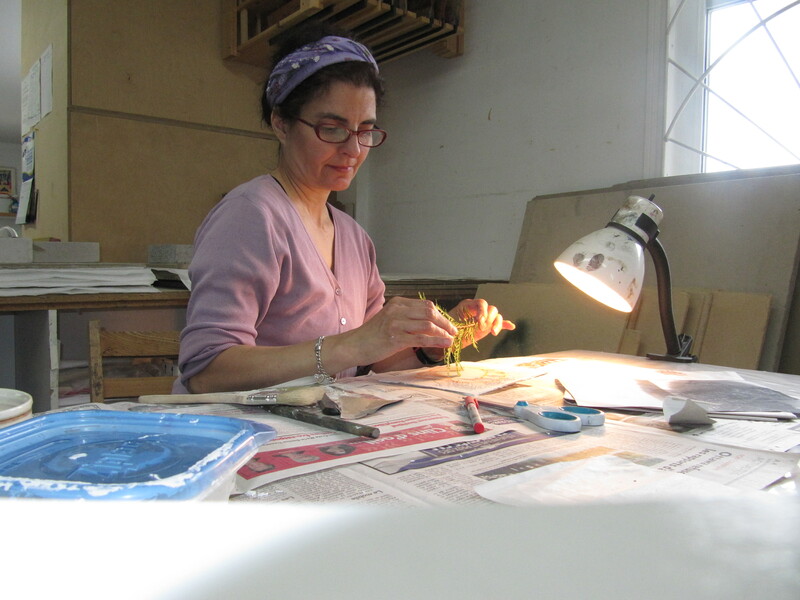 Collagraph is a direct approach to printmaking, allowing for spontaneous work, while providing the possibility of creating more complex pieces. The base plate can be cardboard, wood, Masonite, Plexiglas or metal. 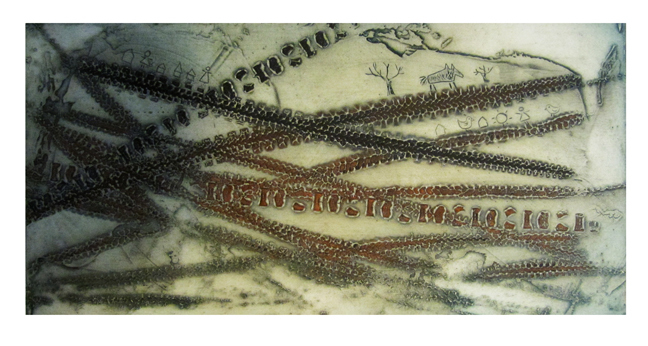 Lines and textures can also be engraved into plates. The plates are printed in intaglio with an etching press. This method can be combined with relief printing by applying ink with a brayer over the textured plates. I have been making collagraphs for twenty-five years. I work on a high density cardboard that I prepare with acrylic medium, yielding durable plates. I generally make editions of 40, however, I have made two editions of 100 each, by touching up plates along the printing process. Collagraph is a flexible medium, lending itself to experimentation. Over the years I have explored two-plate color printing, cut-out plates and large formats. 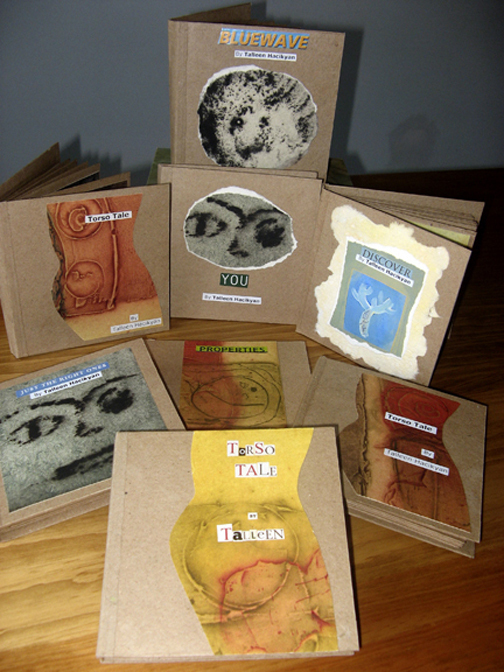 I have also incorporated collagraphs into my papier mâché sculptures and one of a kind artist’s books. Although I use a wide variety of materials, I keep returning to plaster. I use premixed drywall joint compound. Not only is it inexpensive, it does not break under the pressure of the press. Typically I apply the compound with spatulas, shaping it into place with swift movements. Once dry, I often engrave into the compound with a drypoint. It is also possible to imprint objects into the compound. Recently I discovered a way to make bicycle tire prints. I learned the fine art of collagraph at Atelier Circulaire in 1987 from French master printer and artist, François Xavier Marange. François Xavier worked at Leblanc, Lacourière-Frelaut and Maeght studios in Paris, where he printed for great artists such as Miró, Tapiés and Zao Wou-ki. 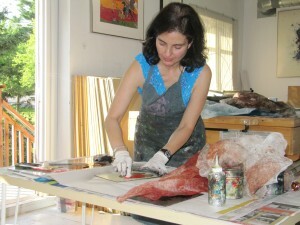 In France, artists were making collagraph prints with oil based, toxic varnishes. In Montreal, Francois Xavier experimented with local, non toxic products with a view to producing a durable plate that could create a full range of subtle printed effects. After twenty-five years of pushing this technique to new places I can say with conviction that collagraph is my printmaking medium of choice. There’s no feeling that compares to entering 5445 de Gaspé, in Montreal’s garment district. In winter there is the immediate relief from the bitter wind that invariably rages on the street, playing havoc with my oversize portfolio-wanna-be-kite. On any given day, however, despite the season, there is always a sense of well-being that overcomes me as I press 5 in the elevator, intensifying the instant I see the turquoise door of Atelier Circulaire. My private space within the communal studio is my haven. Surrounded by my work on the walls and work in progress I feel whole. The outside world disappears for a few precious hours as I get to the task of creating art. I usually have a few projects going at the same time. 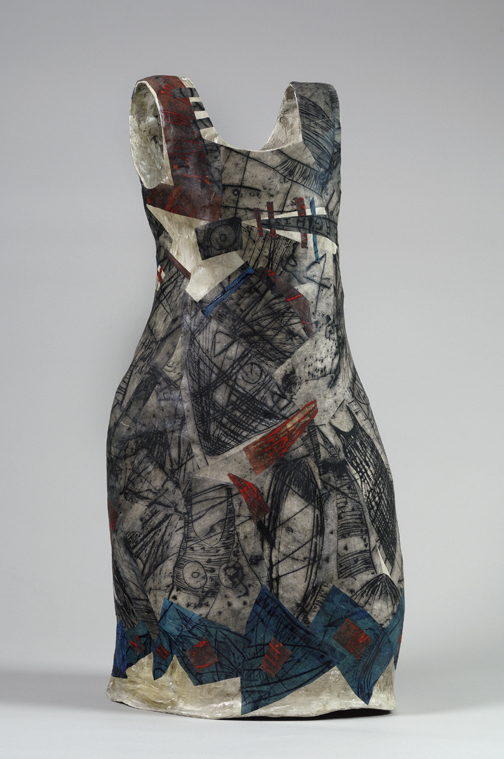 I’ve been working on papier mâché dresses and shoes that I collage with printed Japanese paper. 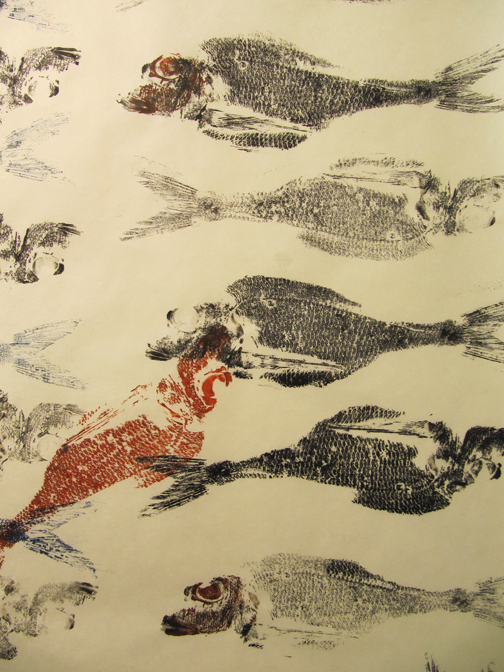 Last week I hand printed a fish on a large piece of ivory Kozuke paper. That morning I went to small fishery on Park Avenue for my day’s catch. I asked the fishmonger, stylishly clad in rubber boots and a wool tuque, if he happened to have any fish that was slightly too old to sell. After he replied, “Non, non, on a pas ça,” with a touch of pride in his portuguese accent, I told him I’d settle for a fresh hand-sized fish with big scales. He showed me a few specimens, resting in peace side by side on crushed ice and after running my fingers over a few, I opted for a Doré rose. At the studio, I inked the poor, albeit oblivious fish, and printed repeated patterns on my Kozuke. I worked fast, to spare my studio mates of the fishy order that lingered as my piece advanced. The next step will be to use this paper to decorate one of my dresses. Yesterday in my private space, I painted on wood panels. 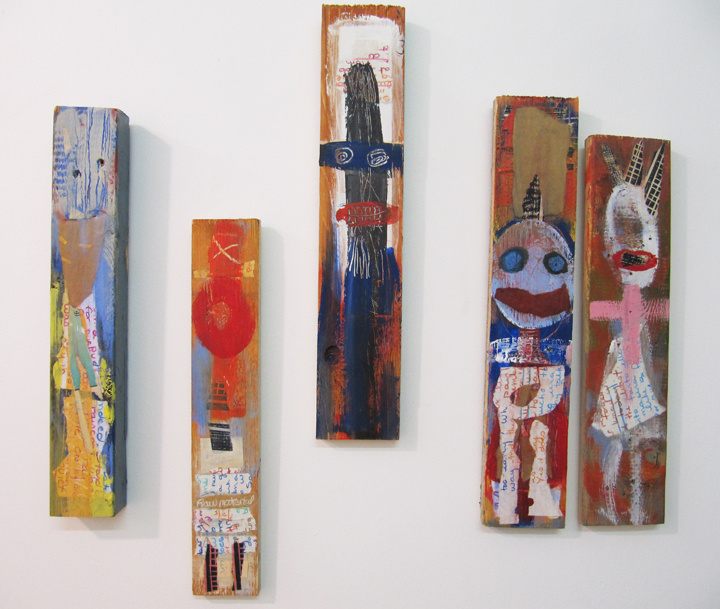 I worked in the same vein as the totems on the wall, made from recycled two-by-fours, combining acrylic paint and collage. One of the elements I’m using for collage is my journal, passed through a paper shredder. It is a cathartic feeling to shred my past and transform it into decorative elements that contain cryptic messages that can be rearranged and highlighted by taking them out of context. Yesterday in my pile of shredded feelings I found the words, Budgie in a green jar. My studio is a place where I can bask in creative energy. This is where I can shred my journal, print fish, mold papier mâché shoes over my feet, engrave erasers, dip a dress into a bucket of plaster. This is where I color my world. This is where I get to the serious business of playing. 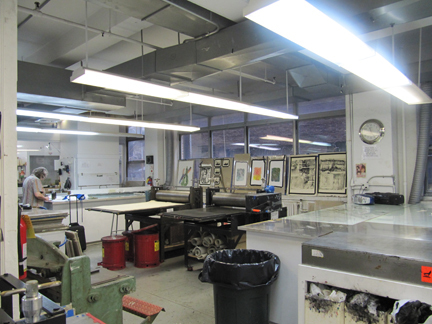 My visit to New York during Print Week would not be complete without exploring the city’s printmaking studios. 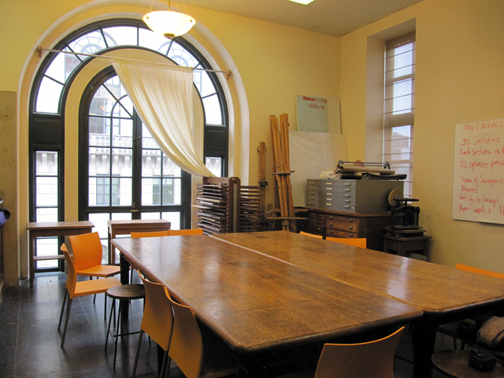 On a brisk November morning, I headed to the Garment District in midtown Manhattan, where the three main printmaking studios are now located. All the workshops featured a members’ exhibition and were open to the public. My first stop was Lower East Side Printshop. 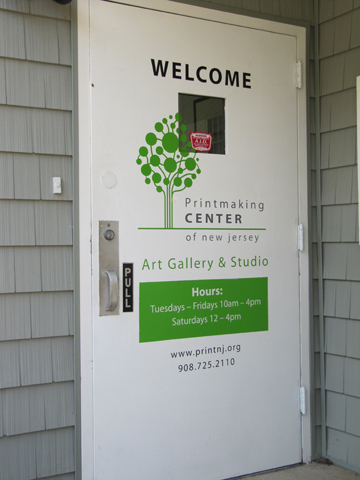 Founded in 1968 the Printshop moved to its present location in 2005. 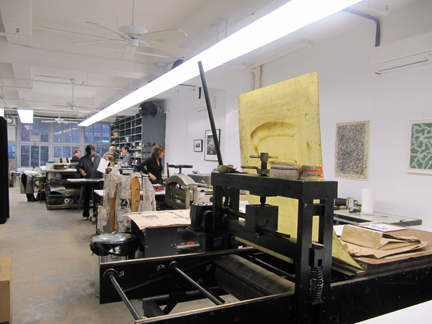 With over 160 artists served each year, it claims to be the largest printmaking studio in the U.S. 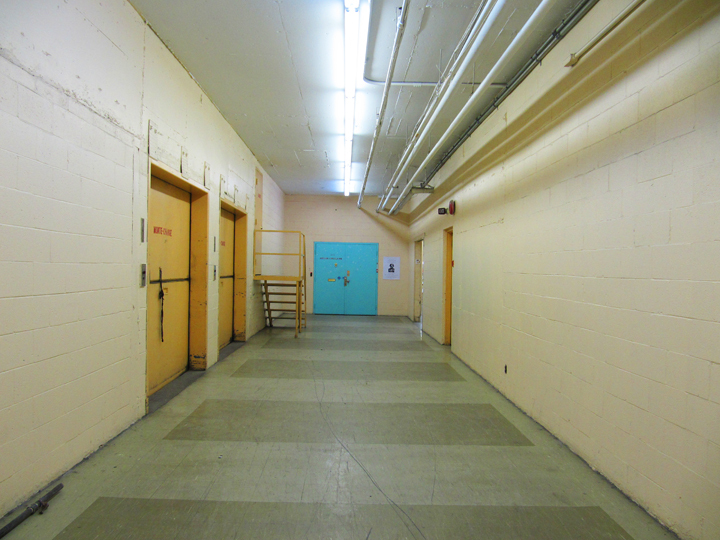 The studio is located on the 6th floor of an industrial building facing West 37th Street. It offers 4000 square feet of workspace. Christine Walia, programs director, gave me a tour. 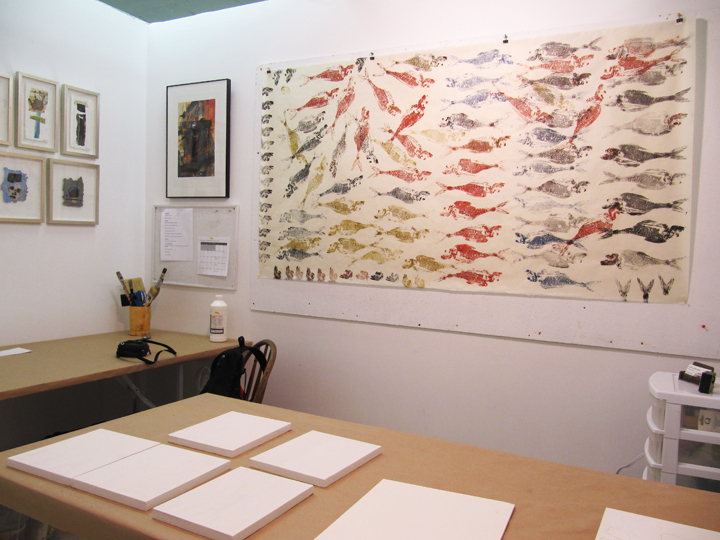 The shared Artists’ Studio, open 24/7, struck me as a well-organized, functional place. It was a quiet morning, with artists’ belongings tucked neatly onto designated shelf space. The workshop has facilities for intaglio, relief, monoprint, waterbased silkscreen techniques, photo and digital processes. There is also a Collaborations Studio, where a couple of artists in residence were working. 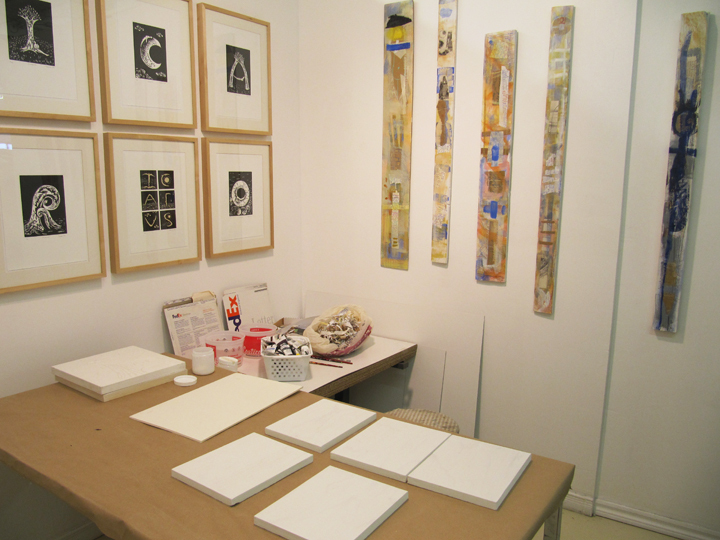 In another section of the studio there is a small gallery and office space. I browsed through some portfolios and chatted with Chirstine. I left with the impression of an efficiently run studio. 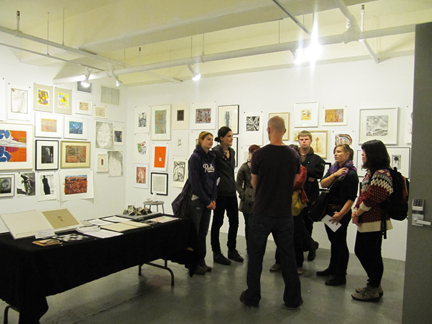 My next stop was Manhattan Graphics Center, an artist-run printmaking studio, a few blocks away. The workshop was bustling. 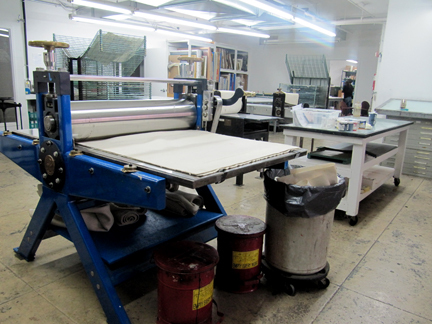 In contrast to Lower East Side Printshop, Manhattan Graphics Center is administered primarily by key holders. Key holders are members who monitor the studio and do chores for four hours a week in exchange for access to the studio when it is closed and for tuition discounts. The monitor on duty was a bubbly artist, bursting with enthusiasm as she showed me around. There was a workshop in progress and the space was infused with a creative energy all too familiar to me. 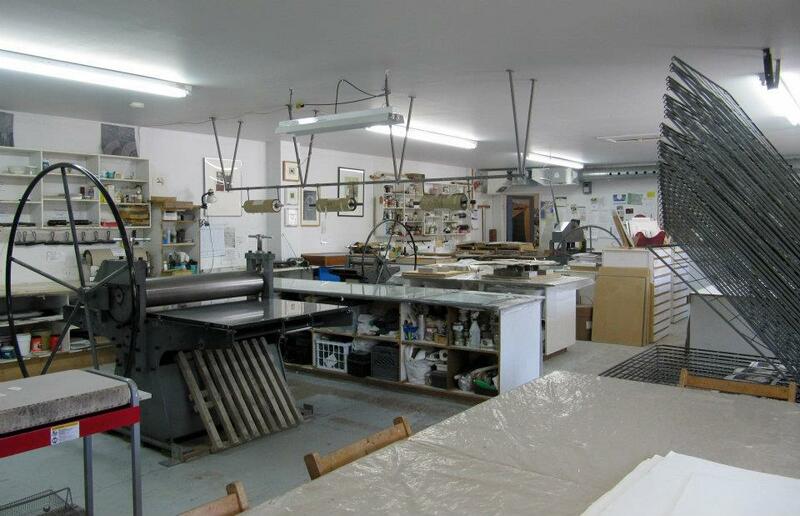 The studio is equipped for etching, lithography and silkscreen, with a darkroom and an exposing room. There is also a gallery and seminars area. The workspace is compact, set up in a long area. Judging from the artists at work, it looks functional and pleasant to work in. 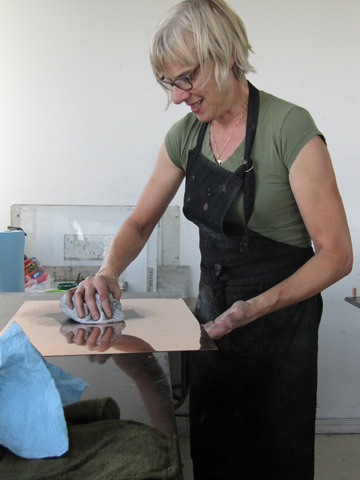 The monitor showed me some of her monotypes and I spoke with Robin Dintiman, a collagraph artist, who also teaches at the workshop. She had two collagraphs in the members’ show. The one that caught my eye, was made with an impressive five plates, and still managed to convey a sense of lightness and transparency. I left after a round of jovial goodbyes and directions to Robert Blackburn Printmaking Workshop, again conveniently located a hop away. Who knew Manhattan would be so easy to navigate? Robert Blackburn, an African American artist, founded the studio in 1948. 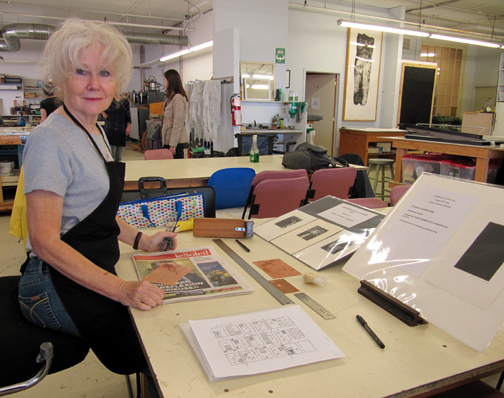 At Robert Blackburn Printmaking Workshop, I was greeted by Connie, a soft-spoken, monitor. An artist worked in the far end of the studio as Connie explained the ins and outs of daily functioning. While the studio features all the traditional facilities, I was particularly impressed by the digital lab that boasts four of the latest iMacs, CS5 and a large format Epson inkjet printer. The studio also has a small room reserved for contract printing. The highlight of my visit was the member’s show at the gallery, a few floors up. In the mid-sized gallery, the walls were lined with prints, reflecting a variety of styles and techniques. There was also a table with a fun assortment of artist’s books. I met Chris Dunnett, Workshop Manager. 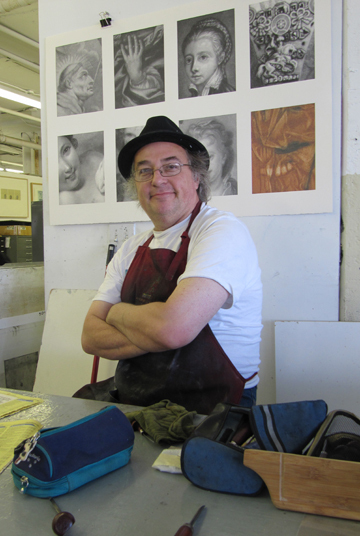 A graduate of Nova Scotia College of Art and Design, Chris is a dynamic, articulate fellow, with a passion for printmaking. 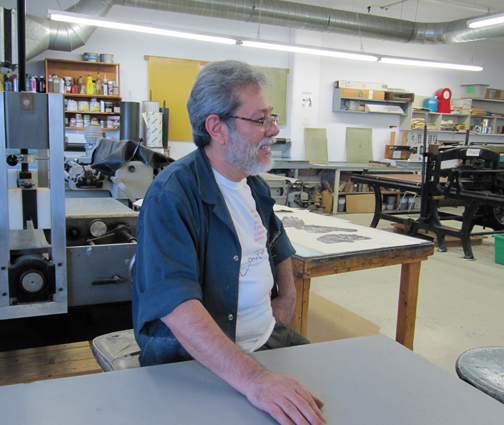 He was giving a pep talk to a group of NSCAD students, giving advice on interning in printshops. I introduced myself and we all chatted for a while. They had all heard of Atelier Circulaire. 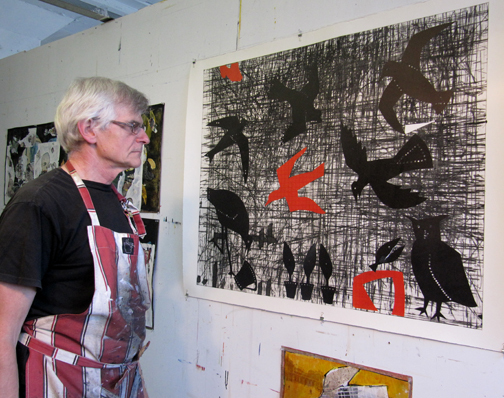 Robert Blackburn Printmaking Workshop. Gallery. I left with Chris’s complex but impeccable set of bus and subway directions to get to the Print Fair. On my way out, I stopped by the printmaking studio and picked up some of their wild pins, for my artist friends back home. LITHOGRAPHERS DO IT ON ROCKS was not the raunchiest one! 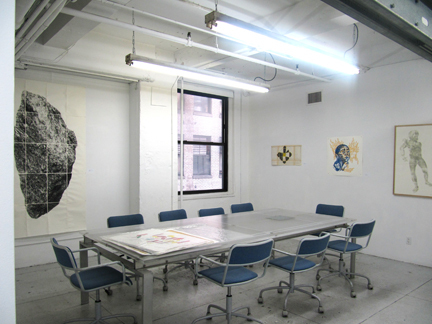 Robert Blackburn Printmaking Workshop. Pins. 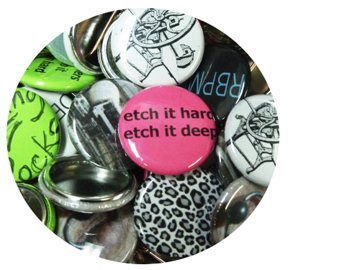 I stepped onto 39th Street with a smile on my face and a pin on my jacket: PRINTMAKING ROCKS! 38 requêtes. 0, 309 secondes.